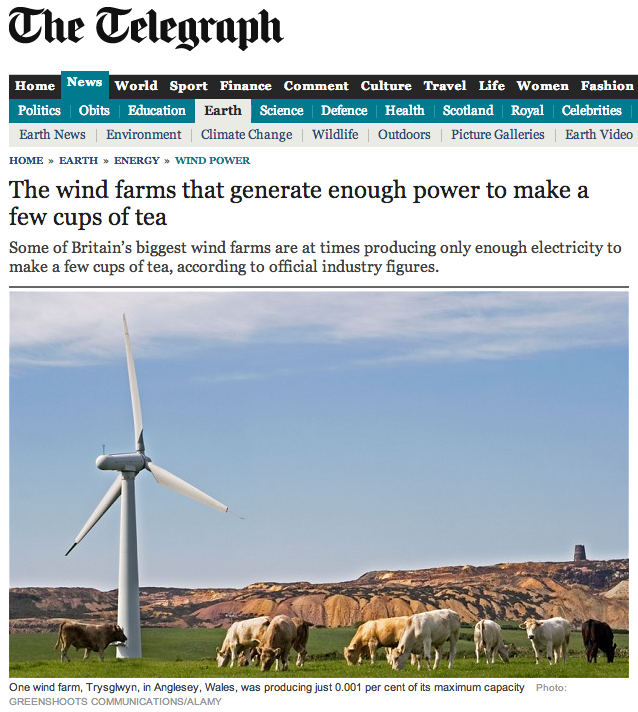 Data released from one of the largest green energy companies, RWE npower renewables, shows that some large scale industrial wind farms are producing enough electricity only to make a few cups of tea at a time. And as if it wasn’t bad enough having greedy rent-seeking corporatist vampires and Big Government joining forces to squeeze the blood out of the taxpayer to fund useless and inefficient ‘feel-good’ delusions. Now greedy windmills are sucking the very electricity out of the grid that they are meant to be feeding back, in order to run basic power supplies on site! A phenomenon known in the industry as “parasitic consumption”. Data released by one of the largest green energy companies shows wind farms producing enough electricity only to boil two to three kettles at a time. At one stage last week, three big wind farms even took electricity out of the National Grid– to run basic power supplies on site – rather than actually supplying electricity to households. The wind farms’ owner said that in still conditions electricity “import” can occur for a few hours until the wind picks up. Such a phenomenon is known in the industry as “parasitic consumption”. The figures show just how little electricity giant turbines produce at certain times bolstering claims by critics that wind turbines cannot be relied upon to provide a constant source of electricity. The wind farm has 14 turbines and a theoretical capacity of 5.6 megawatts (MW). In other words, the wind farm was producing just 0.001 per cent of its maximum capacity. 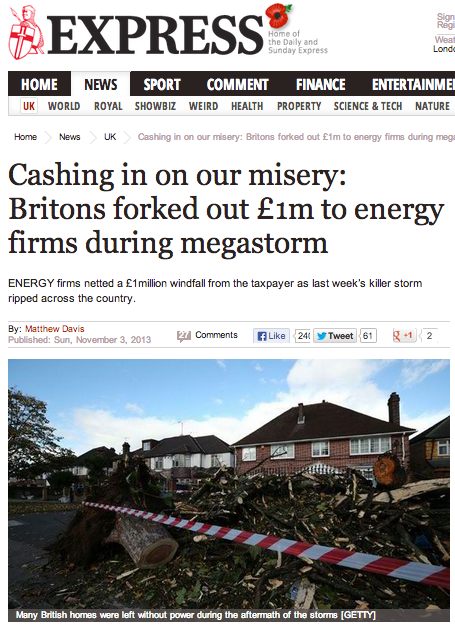 ENERGY firms netted a £1million windfall from the taxpayer as last week’s killer storm ripped across the country. After 80mph gales swept southern Britain, leaving 500,000 homes without power, much of the electricity generated by the biggest wind farms was deemed surplus to the needs of the National Grid. That triggered compensation payments to some of the Big Six energy companies, who are major investors in the on-shore wind industry. The handouts, known as constraint payments, totalled almost £1million over 24 hours. That brings the total paid out to wind farm owners for unused electricity this year to £26million. The compensation deal will enrage hard-pressed homeowners at a time when they are being hit by inflation-busting price rises of up to 27 per cent. 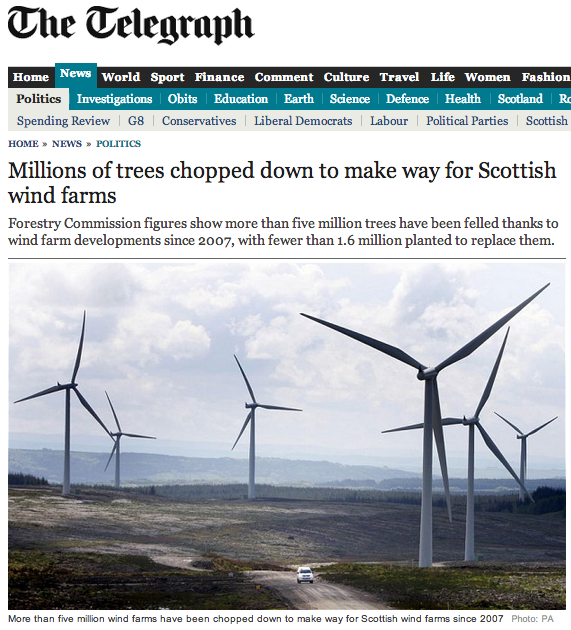 Win Win Wind-farms! A subsidy to build , a subsidy to operate & now a subsidy to close down when it’s too windy! PEER REVIEW: Toxic health risks associated with rare earth metals extracted for use in solar PV’s and industrial wind turbines. I’m now not certain the place you are getting your info, but great topic. I must spend some time learning more or figuring out more. Thanks for fantastic info I used to be in search of this information for my mission. Thanks for every other magnificent post. Where else may anyone get that kind of information in such a perfect approach of writing? I’ve a presentation next week, and I am on the look for such info. We are a bunch of volunteers and opening a new scheme in our community. Your website provided us with valuable info to paintings on. You’ve performed a formidable process and our whole neighborhood can be thankful to you. Hi there, I found your blog via Google at the same time as looking for a comparable subject, your web site got here up, it appears great. I’ve added to my favourites|added to bookmarks.